Would you like to make a difference in someone's life in a rewarding job as a caregiver? We are currently looking for compassionate, caring and dependable caregivers who are interested in making a difference by providing in-home, non-medical care to the elderly. 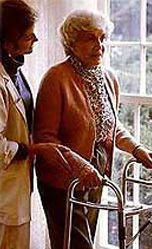 Many of our caregivers are active seniors themselves who develop long-term, satisfying relationships with our clients. If you believe you would make an exceptional caregiver we would love to hear from you! Please contact our employment line to learn more. You may also email us at home@lakeshoreseniorcare.com to request an application.